//Armytek Wizard Pro "2014 NK Tactical EDC Flashlight of the Year"
// For survival & as a utility light or EDC, it offers another source of light because you can use it hands free by setting it down either vertically or on it's side and it will flood light onto what you are looking at so there's less glare. // When walking the flood style light helps provide more area coverage and let you see more of what's immediately around you. 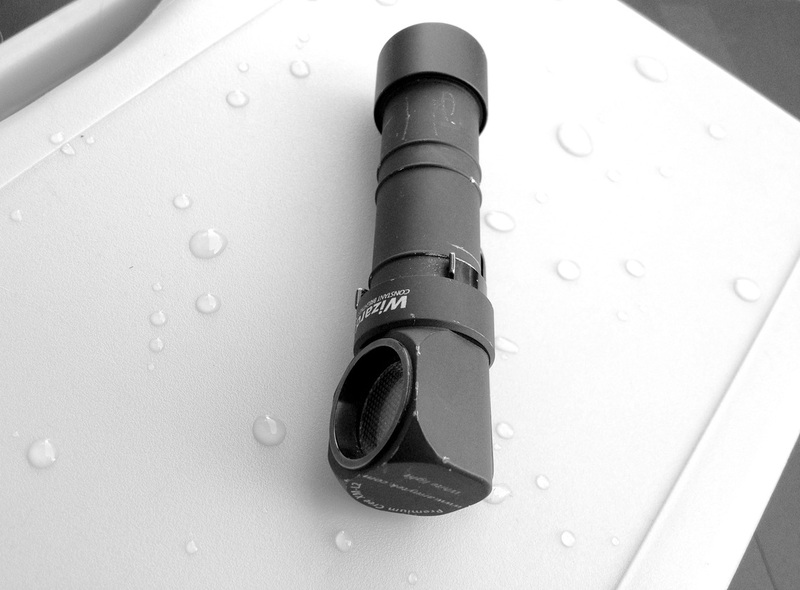 // Higher build excellence combined with superior technology for a compact EDC/ utility light. Structurally designed to work laying on it's side, standing up, clipped to a shirt or vest, fits into molle webbing, as a head lamp, diving flashlight, strong steel reinforced lens casing, thicker flood style lens, squared off threading for extra strength and tight assembly, double O-Rings. Performance has constant brightness drain pattern, flood lens that reduces glare, turbo mode of 900-950 lumens, battery can be upgraded for longer run times, all functions, drain pattern, activation methods, lighting levels can be customized & programmed. // The constant brightness drain pattern and XM-L2 LED means a long lasting battery life that has no perceivable drops in output while operating. This makes for a reliable lighting tool when it comes to referencing daylight, or working for continuous hours. The interface is simple once learned for fast switching of modes. Flood style lens reduces glare up close which makes this the perfect light for EDC and utility tasks. The battery can be upgraded for 30% longer run time through purchasing a 3400MaH cell. The flashlight clips securely and is light weight so won't easily fall out. The output on turbo is 900-950 real world testing OTF lumens which is capable of affecting someone's vision. // What makes this an outstanding utility light is how it tailors itself to different end users. The design compliments so many types of individuals and is truly unique in this. Everyone that purchases this light will find something to love about it and this combined with the outstanding build quality means this has my highest recommendation for utility choice for any profession. For tactical purposes the light is secure in the pocket, won't injury your hand when striking with it, can be shined into someone's eyes, and when used for striking is very effective like hitting with a hammer or pommel. The effect is much better than competitor flashlights that put slight crenulation on the bezels around the lens or on the tail cap have raised guards. This is something that most people I think will have to try for themselves. The blunt flat portion on the Armytek Wizard is much more effective than the pronged circular bezels of comparable lights because the Wizard has a flat solid portion. the flashlight only weighs 56 grams without a battery. The pocket clip can attach at two points for deep carry so it staus in pocket. The head harness attachment can be used to attach the light to a belt or different molle set ups. The flood lens is thicker than average competitors so it's less likely to break. The lens is reinforced with a stainless steel ring for added rigidity. //The high intensity beam (estimated minimum 900-950 true OTF lumens) is capable of disorienting a person if viewed directly up close. The programmable features make it even more tailored to the end user which include such options as turning off the beacon light for tactical conditions or even changing the drain pattern to analog (light output slowly dims as the battery starts to drain) for extending run times tremendously in perhaps survival situations. The user can program the flashlight to operate always on momentary on.